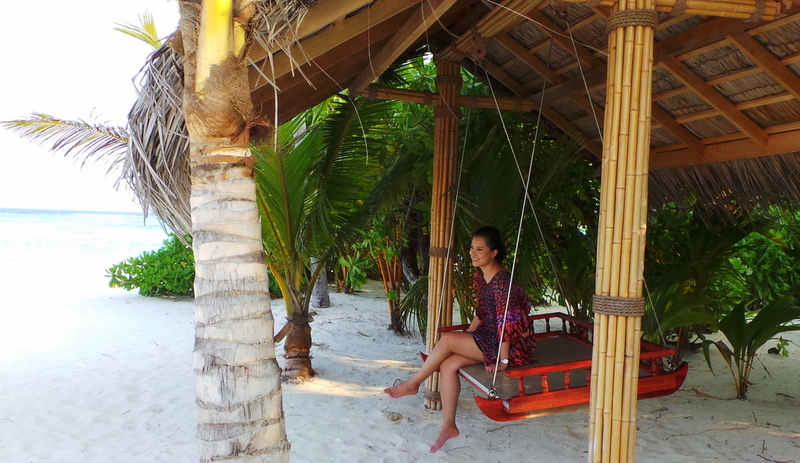 If you havent’ heard yet of Lonubo Private Island in the Maldives , don’t be surprised. 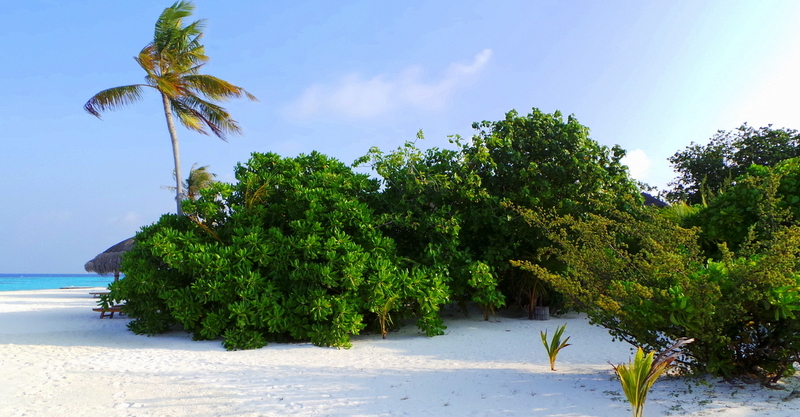 It’s Maafushivaru’s best kept secret, and I reckon most who have experienced it also want to keep it that way: exclusive and where only far and few have come to experience. Located in the same lagoon as Maafushivaru Resort, Lonubo is a tiny, uninhabited island just a few minutes by boat from Maafushivaru. During the day, Maafushivaru guests can hop on a boat and spend the morning or the afternoon snorkelling in Lonubo. But before the sun sets, there is a last boat to transport all people from Lonubo back to the bigger island. Everything is ensured that no one else is left in the island. 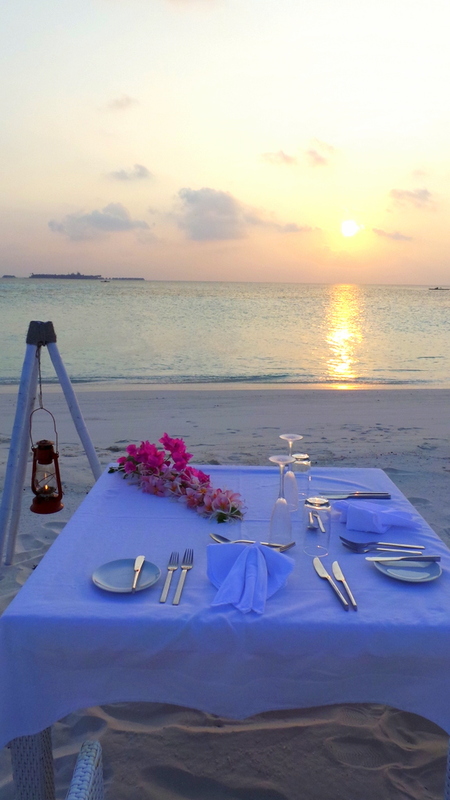 Because by sunset, the entire island is reserved for only one couple to stay the night. When Maafushivaru suggested the concept to us, we were very excited. Just the two of us in an island. Literally. No staff, no host, no-bo-dy. But just in case the mood gets more into a “Cast Away” experience (which frankly, excites me more), I measured the distance from Maafushivaru to Lonubo Private island (above). And yay! Swimmable distance on a “need to” basis. We had a private transfer just as the sun was setting, and it did make for a lovely, dramatic backdrop to the private island. Well, I’m not putting a cap on the number of things but here’s pretty much what we brought: Snorkel and Fins (that counts as 1 in my books), swimwear, and sleeping clothes. And with that, we were left to have the island all to ourselves until the next day. nope, no one is hiding behind the foilage. It’s just your villa for the night. The crabs I need not worry about. They were tiny, and they just kind of skittle around you as you walk. I find them quite cute actually. Now the birds, on the other hand, we soon learned were our grumpy co-inhabitant of the private island. Correction, to them we are not co-habiting, we were probably invading their turf. I will spare you the dramatic hilarious shots. Zombie was trying to shoot photos of me with the sand , trees and sun in the background. These little white birds (they are small but definitely fierce and protective) started swooping down on me- they didn’t peck really, but just a show of strength kind of warning. Swooping down low just past your head. The photos that came out were of me cowering with arms covering my head. just me, the sea, the sand, and the birds. We take that as a positive sign, as it means that the island really is uninhabited by humans, and nature has taken over , as it should be. As soon as we got nicely acquainted with the birds and we found a way to skittle around them, we explored partly hidden beach villa where we are to sleep for the night. Maldives’ version of cabin in the woods. 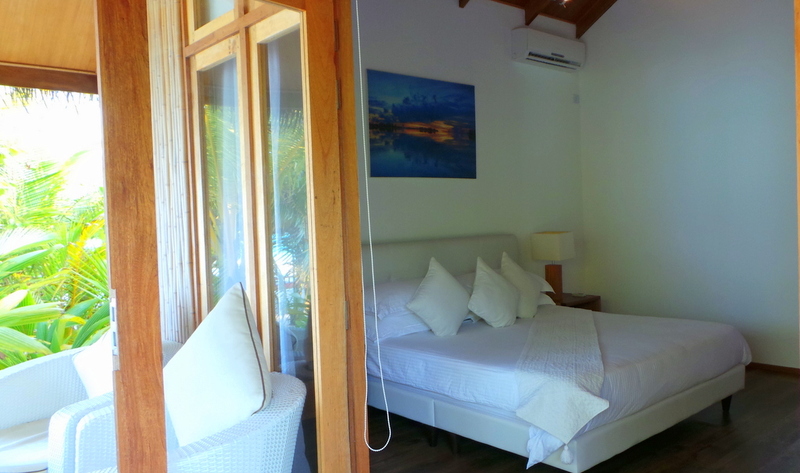 It has all the facilities found in rooms on the mainland resort Maafushivaru. Flatscreen TV, tea and coffee making facilities, wardrobe, and a very spacious semi-outdoor bathroom. 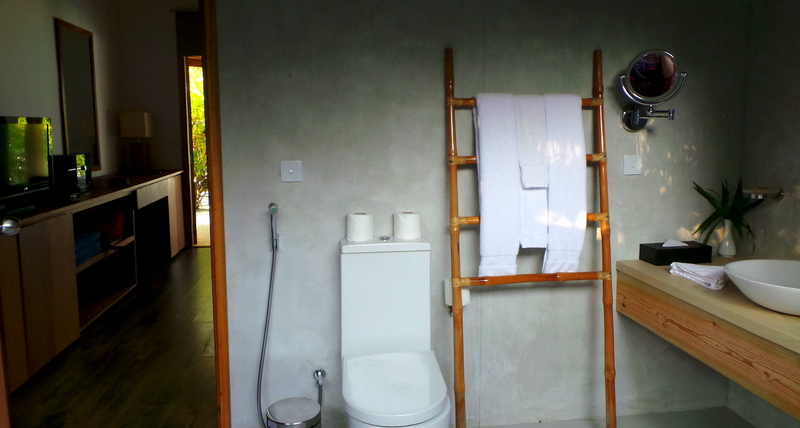 The sink, toilet and main bath floor are within the roof, and the shower is completely outdoor. 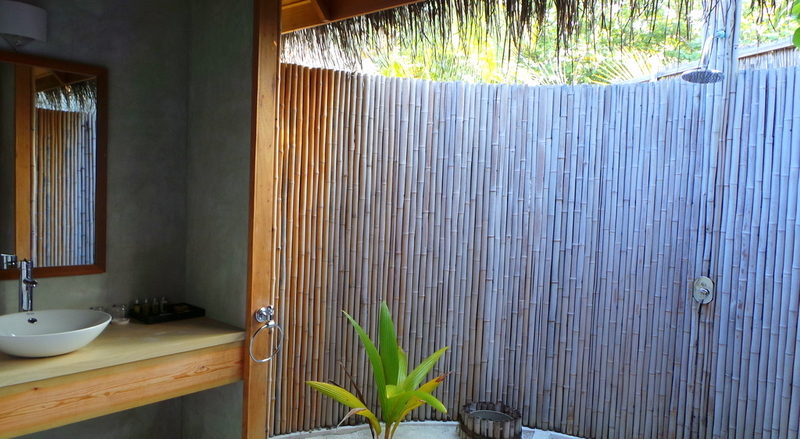 And since arriving in the Maldives, I found the joy in showering outdoors. The dinner, set up in buffet style, was of course covered in Glad wrap to protect it from our grumpy neighbours (birds). I loved the torches (there were a number of them throughout the beach) in case we are still there after the sun sets. The soft white sand beneath our bare feet, the sun setting like a fiery wink, the pink-hued skies. 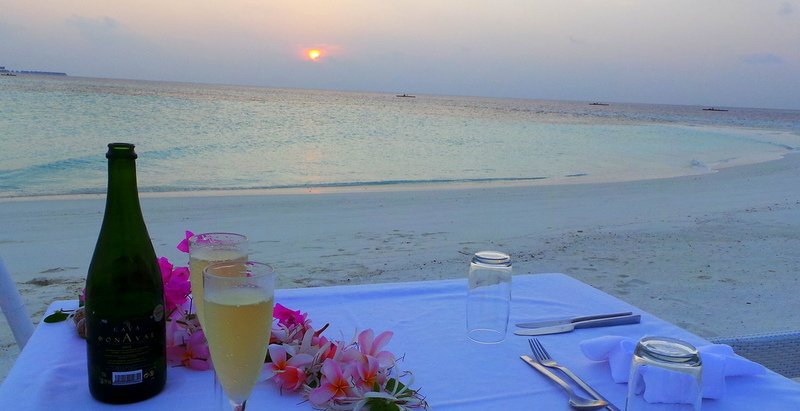 My romantic mode momentum was broken by the loud pop of the champagne bottle cork (after my husband thumb wrestled with it as there was no corkscrew) bringing me back to the reality of being in this private island where private dreams are made of. But seriously, this is quite possibly the most romantic thing we have ever indulged in. We wined, dined, and talked till the sun was completely gone. After sleeping very comfortably in our villa, we woke up so refreshed the next day. At 9am, champagne breakfast was brought to us by the staff from the main resort. 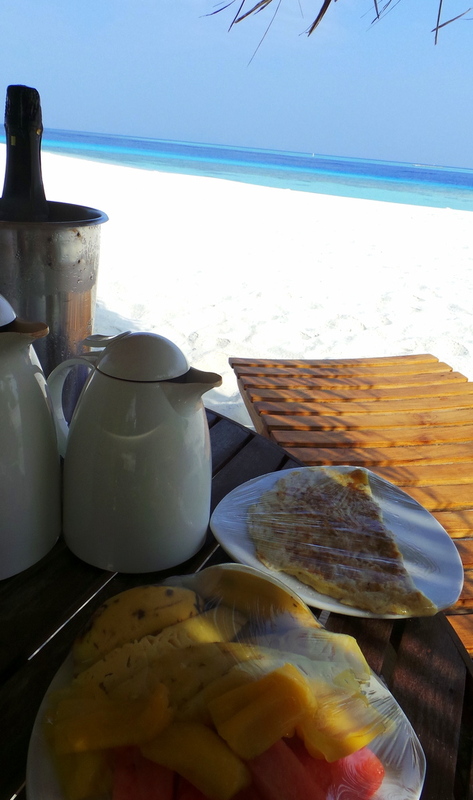 We had the option of choosing what we wanted for breakfast the afternoon before we arrived on the private island. It’s worth mentioning that the sand in Lonubo is very fine and white. The waters were extra calm too, an endless stretch of aquamarine. It was nice to really laze in the sand under the sun. 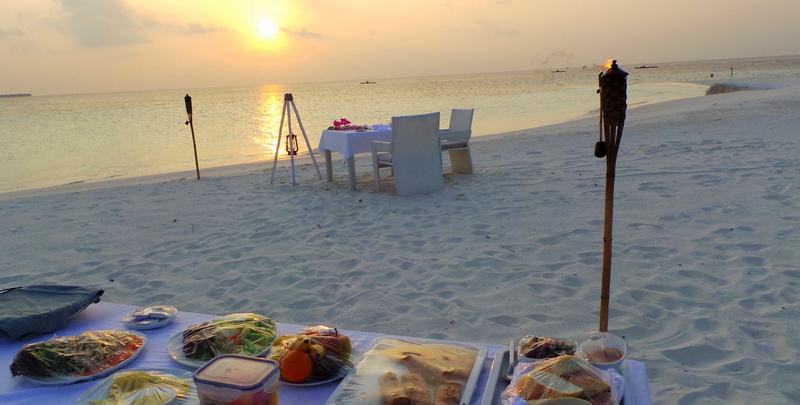 The Lonubo Private island remains to be one of our most memorable not just in the Maldives, but ever. There’ just something about being left all alone in such a beautiful place. So what is it that’s made this private island such a happy place for us? It’s the privacy, the serenity and the juxtaposition of a luxe villa (where all amenities are there including a complete L’Occitane toiletry set) in an island inhabited by wildlife. It’s the hilarity of fending off tiny birds thinking they’d come pecking out your eyes. It’s the inside glance days later, that we would give each other when we’d see a bird of the same species in a different island. It’s the romance of doing something for the very first time. We have stayed in a couple of private island resorts previously (outside of the Maldives), but none as private as this. Whether you’re newlyweds, a loved-up couple, celebrating your kids’moving out, rekindling the fire, or simply just someone who would like exclusive solitude and paradise for the night — I highly recommend an overnight stay in Lonubo. This has been truly a remarkable experience, a very well-kept secret that I’m grateful Maafushivaru has let me in on. 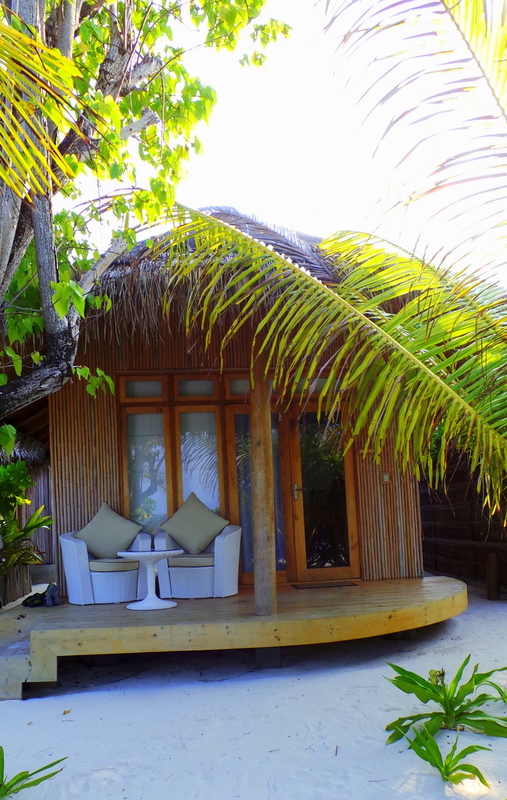 For a full review of the main resort, Maafushivaru, please CLICK HERE. This is so amazing – it brought tears to my eyes. Aw thanks Ann 🙂 Brought tears to my eyes too (but from laughing / smiling) . It’s kind of hard to top this one of a kind experience! That’s amazing!! What an incredible experience and fantastic job with the writing and photographs. You two made me feel like I was just there too. I love the idea of a private island for a night. I hope Bell and I can experience this one day. Thanks for the inspiration!! My self and my wife didn’t have a honeymoon as we had family issues after we got married and would love to just give her 1 lovely treat just to show my love for her. This would make it amazing and the perfect honeymoon a bride could ever dream of. Hi Scott, I think it would be fantastic for you and your wife to experience a special honeymoon/ getaway- be it in a private island or not. We ourselves had a simple honeymoon. It’s more meaningful for us to splurge when you have been together for many years – all the more reason to celebrate. 🙂 Take her to the Maldives, she will be a very happy wife!